Looking for a quality local removals company? It is always best to make sure when you are packing all of your goods, they are packed safe & securely for the journey! We then collect all of your belongings on the agreed date, and our professional friendly team will safely load up the van! Once everything has been loaded, we will deliver all of your belongings to your new destination safe and securely! A long established removals company specializing in house moves and office relocation in the UK and Europe. 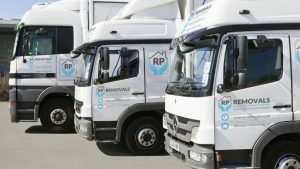 At RP Removals, we are focused on providing removals services with the highest levels of customer satisfaction. With a variety of offerings to choose from and a great customer service, we will do everything we can to meet your expectations. We have to say that we are seriously impressed with RP removals. Having used “low cost” removals companies before, it would be an understatement to say that we were a little anxious about this move, being long distance from Aylesbury in Bucks to outside Aberdeen. We split the move over two days – the first afternoon to pack, and then the next morning to load. We did this because we had cleaners and carpet cleaners coming in on the final day in the old house, and we didn’t want an overlap.We were right to have done this. The movers were really nice guys, no problem too big or small, and always double-checking to make sure they had packed the right items.. They arrived when they said they would. They had said that they would meet me at the new house, 500 miles away, at 11 am on the 1st June. I arrived at 9am, and they had been there for an hour! Two guys were sent to offload, and they had everything in the house by 12 noon, and then turned around for the long drive home. We had one broken whisky glass, with everything else in perfect condition. Nothing missing whatsoever. We cannot recommend this company enough, and if they operated up here in bonnie Scotland, I would certainly use their service again. The guys at RP were super efficient – loading and unloading in less than an hour! Also arrived very early at 7.30am as requested! Cheers guys! We chose RP Removals after getting quotes from several companies. They were quick to respond, very helpful so we chose them. We were very glad that we did. On the day the guys were very friendly and worked quickly to get our stuff packed into the vehicles. Nothing was too much trouble. At the other end, they quickly and carefully put everything into the new house. We were very happy with the service we got and would definitely recommend. It made our moving day a breeze. Thanks, guys. A fantastic incredibly hard-working team that started at 8 am and finished at 10 pm! Never grumbled, so polite and genuinely nice guys! Wouldn’t have been able to afford other companies with inflated prices! Thank you RP removals! I’d definitely use you guys again! The service you provided for us was exemplary. The guys packing were incredibly efficient, the move day you said 8am start and you were there on the dot and the fact that you dragged more staff in to unload was excellent. Even the collection of empty boxes was efficient. Great delivery service, very polite and professional team. I will definitely be doing business again. Dear team at RP removals – thank for doing such a great job in moving us to Cornwall, you have gone above & beyond in your service – thank you again & hope you all have a great xmas & New Year. Extremely helpful and professional service, made move completely stress free, highly recommend, first class service. Excellent service at short notice. Would happily recommend to friends and family. We were very pleased with the service. They were reliable, friendly, took great care moving our furniture ensuring the carpets and walls were not damaged. Thank you! Thank you for helping us in making our move so seamless!! The quotation turnaround time was super-fast and the gentleman on the site was friendly and helpful !! Happy to rate 5 stars for outstanding overall service!! Your men were very professional, caring for every item with consideration for our requests. The move went very smoothly, with the van coming right on time and leaving promptly once loaded. We would happily recommend your services to others. RP removals moved us from Bedford to Dorset and were simply amazing! They offered great value for money not charging us for an additional last minute pick at another location. Excellent service delivered by Robert and his team. I would highly recommend them and will certainly use them again. Professional and Excellent service. Removal team came to the flat 7 am and the job was done by 11 am. Thank you very much. Mine was only a small flat move into a local storage unit, however, the service from start to finish was exemplary! Professional , keeping me posted of all steps , back office thru to the movers were fantastic! I was so impressed with your level of excellency of your removal service. The two gents were very professional, decent and hardworking. Thank you so much. I have already sent your details to few of my friends in order to recommend your service to their clients. Can’t recommend RP Removals highly enough. We had issues with our move date and only managed to confirm the move the day before but it was no trouble. We hadn’t packed properly but the team of 4 super helpful guys came in, took over and packed up our entire family home before lunch. They were polite, efficient and caring about our possessions. They worked so hard putting everything in our new home nicely and where it was needed and there was not one issue with breakages/damage. Would definitely use again. Thank you so much. Whether you are looking to move home, or you need assistance with moving your office to a new location, we can help assist with all requirements... read more. © Copyright RP Removals. All Rights Reserved. Website design by Freelance-Creator.